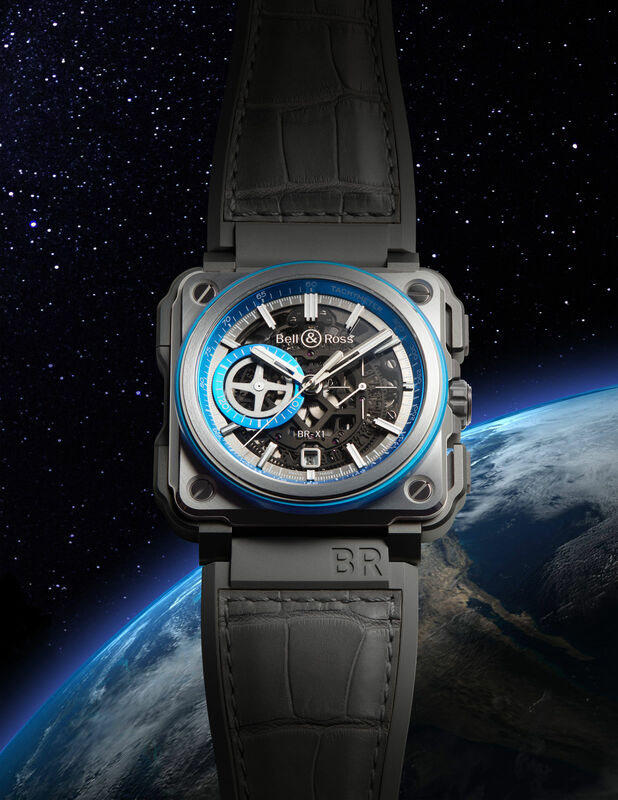 Bell & Ross has introduced a space-themed version of its BR-X1 hypersonic chronograph earlier this year, the BR-X1 HyperStellar. Mechanical chronographs have always been part of the official kit of astronauts and cosmonauts. These watches have enabled missions to be completed in situations where electronic motor systems have malfunctioned. 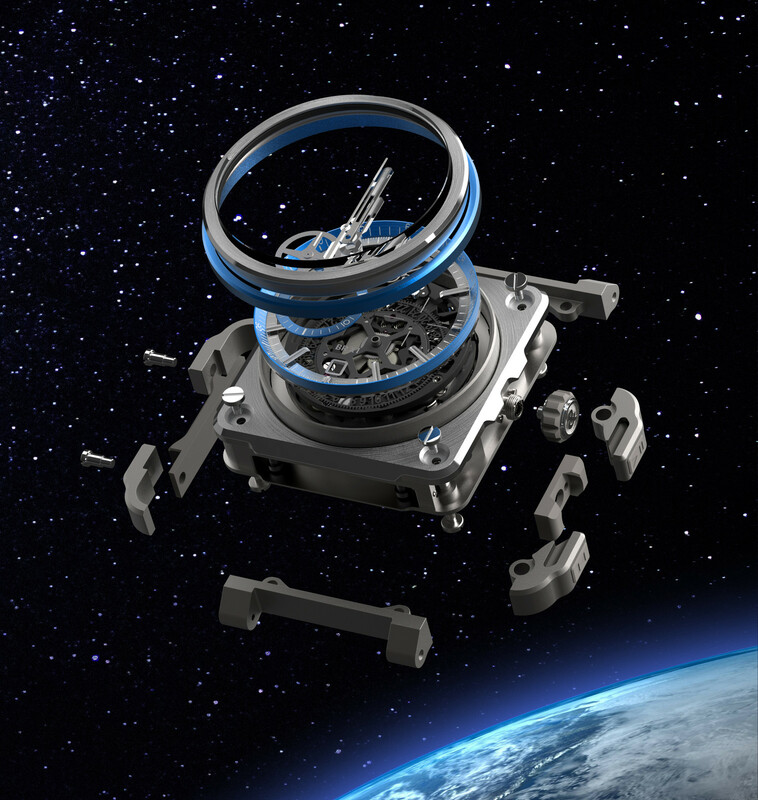 To survive in space, a watch has to respond to certain specifications: resistance to extreme temperatures, corrosion, impacts, acceleration, pressure, vibration and more. This is not easy to achieve. Bell & Ross has designed the BR-X1 HyperStellar as a horological space capsule and made sure that the watch is suitable for use with gloves. The predominance of stone grey and electric blue is a reference to two colours closely associated with space exploration: the grey of the moon and the blue of the Earth. The BR-X1 HyperStellar chronograph features a 60-second counter in the centre, the minute timer on the chronograph function is positioned at 9 o’clock and instead of a hand it features an ultra light aluminium disk resembling the blades of a turbine. On the flange appears a tachymetre scale in blue. Made from grey-tinted sapphire crystal and featuring appliqué metal indices filled with Super-LumiNova, the dial forms a clear window through which the movement can be admired. Through the usage of titanium and aluminium for the case the BR-X1 HyperStellar is a very light watch. These two materials are widely used in the aerospace industry. Aluminium is known to generate an impermeable oxide lawyer, which protects it against corrosion. And titanium has exceptional corrosion resistance properties, high biocompatibility and properties that enable the production of small, thin parts that are light yet strong. The case measures 45 mm in diameter, the bezel’s protective insert is in blue anodised aluminium. To protect it from impacts, the square case of the BR-X1 HyperStellar is covered with a bumper in the rubber that acts as a peripheral protective shell. A rubber grip function has also been integrated to ensure better handling even when wearing gloves. The case is water resistant up to 100 metres and combines polished and brushed surfaces. The Bell & Ross BR-X1 HyperStellar is powered by the calibre BR-CAL.313, a skeletonized, mechanical automatic movement. It can be seen through a small circular opening in the caseback. This watch comes with a grey alligator and rubber strap and is limited to 200 pieces. This entry was posted in Automatic Wristwatches, Chronograph, Mens watch and tagged aluminium, automatic movement, Bell & Ross, Chronograph, Men's Watch, skeletonized watch, tachymetre, titanium, wristwatch by admin. Bookmark the permalink.